Typewritten Letter Signed, one and a half pages, octavo, Greenway House, South Devon, May 5, 1954. To Joyce Lambert, in London. “Witness for the Prosecution” was originally a short story (“Witness for the Prosecution and Other Short Stories”) published in 1948. It opened in London on October 28, 1953 and was made into a movie (starring Tyrone Power, Marlene Dietrich, Charles Laughton, and Elsa Lanchester) in 1957. 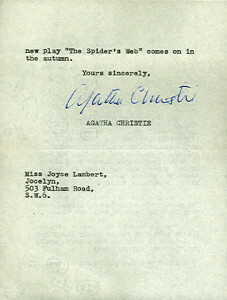 “The Spider’s Web,” which Christie wrote expressly for its star, margaret Lockwood, opened in the West End on December 13, 1954. 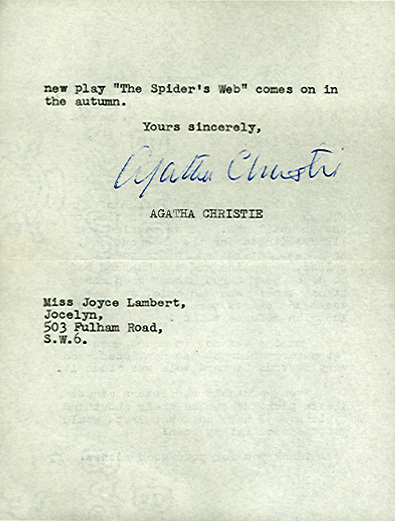 Agatha Christie was at the peak of her West End career with “The Mousetrap” and “Witness for the Prosecution” still running.